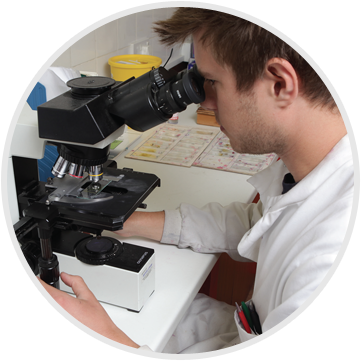 The CVS Laboratory Division offer an extensive diagnostic service including:- Biochemistry, Haematology, Endocrinology, Serology, PCR, Microbiology, Allergy Testing, Dermatological testing, Cytology and Histopathology. As part of our service we offer a door to door courier collection provided by our employed drivers and our own fleet of vans. This services is dedicated to picking up only diagnostic sample destined for our laboratories and the routes now cover the whole of England and Wales. 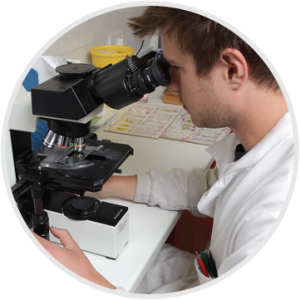 With the combination of dedicated couriers and 36 pathologists, we ensure we offer routinely one of the fastest and accurate diagnostic services with in the UK. Until 2013 our service was predominately aimed at general domestic animals, cats, dogs with a good base of more exotic clients including many zoos and also over seas clients from the likes of the Falklands, Shanghai and Abu Dhabi. However we launched our Farm Animal diagnostic service towards the end of 2013 as with the imminent closure of half of the government labs, this was a good potential for growth. We have employed 3 ex-government pathologists and now have the knowledge to support the quality results that our laboratories produce. Using our existing courier routes we are now able to offer the Farm Veterinary industry a superior diagnostic service than that previously offered by the government laboratories. As a result our client base growths monthly. We launched the MiLab in-house analyser business in 2014 and currently have an install base of over 300 practices. The CVS diagnostic industry goes from strength to strength and has shown double digit growth for the past 3 years.